U.S. sends more troops to the Middle East, Twin Cities peace groups say no | Fight Back! St Paul, MN - 30 people in the Minneapolis- Saint Paul area joined a weekly peace vigil on April 27 after organizers issued a call for people to join the event as a way to give an anti-war response to the announcement by the Obama administration that additional U.S. troops are being sent to Syria. A steady light rain fell on participants during the event. One participant said, "Rain or not, we want to make a statement against this new escalation of U.S. intervention." Many people driving by during the very busy rush hour traffic honked and waved in support of the anti-war message. The Obama administration announced on April 25 that 250 U.S. Special Forces soldiers will be sent to Syria. This announcement follows the decision last week to send additional U.S. troops to Iraq. The U.S. war has been steadily escalating as U.S. forces carry out daily bombing missions in both Iraq and Syria. The weekly vigil is sponsored by the End War Committee of Women Against Military Madness and Twin Cities Peace Campaign. Organizers often issue calls for people who do not normally attend to come out to use the event as a way of responding to events. A statement issued by organizers says, "A new chapter of U.S. war in the Middle East has been opened with the announcement by President Obama that the U.S. will send 250 additional Special Forces to Syria." The statement goes on to say, “U.S. intervention in Syria will not bring peace, justice or stability to that country; years of U.S. bombs, wars, occupation and sanctions in the Middle East has not produced peace, only more war, more devastation and more refugees. Congress is allowing this new round of war to unfold without opposition; only the people can stop this continued escalation of U.S. intervention in the Middle East." 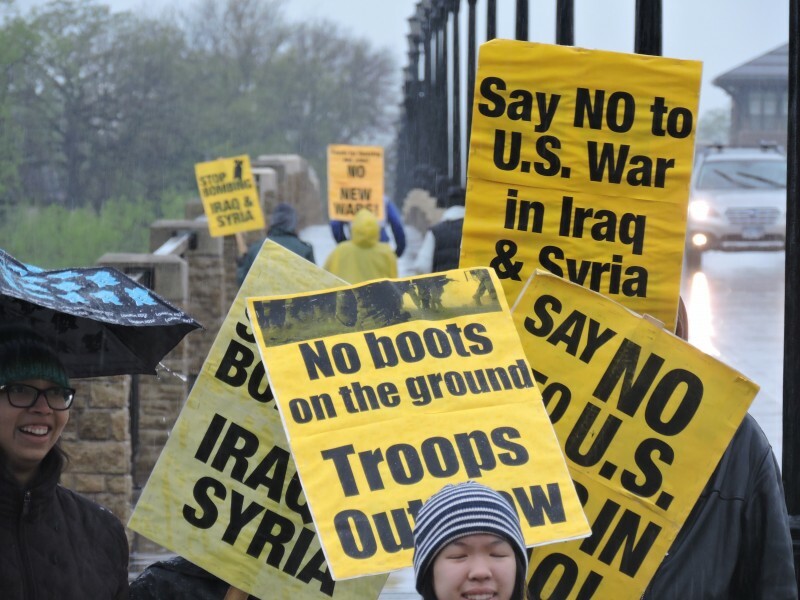 Other peace and anti-war groups, including Minnesota Peace Action Coalition, Anti-War Committee and others sent out notices for the event.